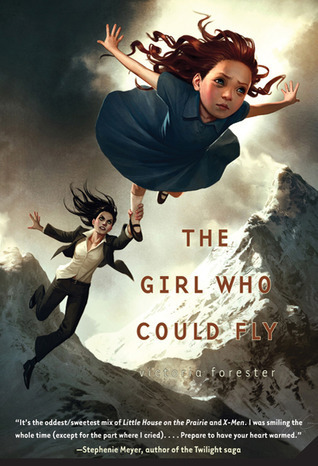 If this novel’s premise sounds a little bit like X-Men, you wouldn’t be entirely wrong, but the super-gifted children in The Girl Who Could Fly are not mutants – they’re just average kids blessed with special abilities. Premise-wise, it’s been done before – an average kid discovers she’s gifted and meets other kids just like her. But the things that set The Girl Who Could Fly apart are its a sweet story and immediately likable protagonist. The narrative is told from Piper’s perspective with some exceptions (see my gripe about that below). I found myself so emotionally connected to Piper that when she was happy, so was I. When she was sad, I was, too. And when she got cotton-pickin’ mad, so did I. Some readers may not like Piper’s dialectal tone, but for me that added to her charm. As for the rest of the cast, Piper’s peers and even the adults at the institute were fleshed out fairly well for a book of this size and intended audience. Granted, some characters run close to being stereotypes but they manage not to completely cross the line. My only genuine complaint about the novel is its narrative inconsistency. As stated above, most of the story is from Piper’s perspective but it occasionally drifts into other characters’ vantage points, such as the calculating genius Conrad and even Dr. Hellion. Younger readers might not notice this shift but I found it a bit rough around the edges when it happened, which wasn’t often. I think I would have found it less jarring if it occurred more frequently with Piper sharing part of the narrative with some of the other characters. Another issue some readers might have (though I didn’t) is the principle message of the book. Let me state there is absolutely nothing wrong with telling kids that it’s okay to be an individual and to embrace and use their talents. But sometimes this message gets hammered home a little too much in this book, especially when one character touts a “different is bad, normal is good” philosophy that is a bit heavy-handed. Again, the execution of this theme might tie into the primary age group for this book where directness is better than subtle inference. So it’s not necessarily a negative in and of itself but it is something that I picked up though I’m not picking it apart. Likewise, some portions of the book that seemed weaker than the rest was the introduction of the character J. (no, not the Men in Black character) who tries to help Piper. While J. is shown briefly early on, his character is all but dropped and then, even after a later exchange with Piper, is never brought back into the picture. I’m not sure if either he wasn’t supposed to be present but was added as a deus ex machina of sorts or if he had a stronger role in one draft and was omitted in other versions but the published version incorporates some of the original draft. I might have just been missing something here but it left me scratching my head, especially since J. tries to help Piper in a pivotal scene. That’s a pretty big deed to not get much credit for it later on. Lastly, Piper seems too eager to forgive another character for betrayal. (And, no, I’m not going to reveal spoilers this time.) Granted, she’s not the type to hold grudges but her casual response didn’t feel entirely believable, especially considering the gravity of the offense. In the same way, the closing chapter, while charming, wraps things up a bit too quickly and neatly. Overall, none of these are true negatives, especially if you keep the book’s primary demographic in mind (which isn’t adults). While these things don’t keep me from enjoying the book, they are some of the story’s weaker moments. All of that being said, I did appreciate Piper’s depiction as a Christian girl. While the book isn’t overtly religious, the theme that each person is “fearfully and wonderfully made” is fairly evident. Likewise, Piper prays, blesses her enemies, is nice to everyone, and keeps her cool. While her parents seem strict, they raise her right in terms of her values and Piper almost never strays from them. Rather than being a goody-goody, Piper is an old fashioned, down-home girl who wants to do what’s right and fair. This aspect of her personality is derived from her Christian upbringing but neither her family nor her are portrayed as Bible-thumping blowhards. So kudos to the author for avoiding that trap. I thoroughly enjoyed The Girl Who Could Fly for its charming characters and story as it’s sweet without being saccharine. While it does possess a few narrative weak moments, it delivers where it counts, especially as an edifying read. Anyone who has ever felt like an underdog will immediately relate to Piper McCloud and experience a catharsis by the end, regardless of how old they are.